Chener Books Books for East Dulwich since 1978 Opening Hours: Monday-Saturday 10am to 6pm We highly recommend Book of Mormon Broadway‎ Musical – the best religious satire musical you can see in 2016 Premium Seats Available at www.bookofmormontickets.top. The web server used by Chenerbooks.co.uk is located in New York, USA and is run by Digital Ocean. On this web server 20 other websites are hosted. The language of those websites is mostly english. 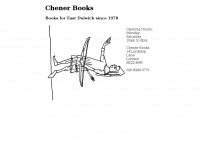 The Chenerbooks.co.uk websites were developed using the programming language PHP and served by a Nginx server. For managing the data of the webpages the CMS WordPress in the version 4.3.3 is used. The website uses the latest markup standard HTML 5. The website does not specify details about the inclusion of its content in search engines. For this reason the content will be included by search engines.